Kangirsuk, meaning ‘the bay’ in Inuktitut, is located on the north shore of the Payne River, 13 km inland from Ungava Bay. The village lies between a rocky cliff to the north and a large, rocky hill to the west.Kangirsuk, meaning ‘the bay’ in Inuktitut, is located on the north shore of the Payne River, 13 km inland from Ungava Bay. The village lies between a rocky cliff to the north and a large, rocky hill to the west. It is situated 118 km south of Quaqtaq and 230 km north of Kuujjuaq. The numerous lakes and rivers of the area are well-known for their arctic char and lake trout. The strong tides that occur on the Payne River make it an extraordinary place for mussel harvesting. The richness of wildlife and flora of the surroundings of Kangirsuk is also impressive. On the islands of Kyak Bay and Virgin Lake located to the east and north-east of Kangirsuk, respectively, important colonies of eider ducks nest every year. Inuit women collect the precious down of those birds to make the warm parkas which protect Kangirsumiut from the biting, winter cold. Kangirsuk, meaning ‘the bay’ in Inuktitut, is located on the north shore of the Payne River, 13 km inland from Ungava Bay. Kangirsuk, like many Inuit villages of Northern Quebec, developed around trading posts. The French fur company Révillon Frères built a trading post in 1921 and, four years later, the Hudson’s Bay Company followed. Both trading posts were managed at times by Inuit. The federal day school was inaugurated in 1959. Thereafter, Inuit from the region started to settle permanently in the village. 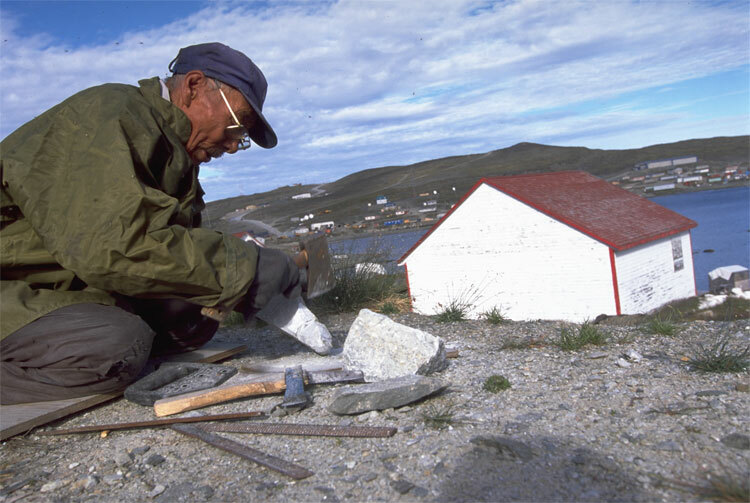 In 1961, the federal government introduced health, housing and social services to Kangirsuk and throughout the 1960s the community developed intensively. In 1965, an Anglican mission opened a church in Kangirsuk and the following year the local co-operative store was established. In 1981, Kangirsuk was incorporated as a municipality. Payne River: renowned for its high tides and excellent mussel harvesting. Nearby numerous lakes and rivers: abundance of arctic char and lake trout. Wildlife observation: beluga, seal, caribou and many bird species. Archaeological sites: not far from the village on Pamiok Island is the stone foundation of a long-house which some archaeologists believe to be vestiges of Vikings, presumed to have sojourned in the area in the 11th century.